Tthe first half of the twentieth century is the era of mass media. 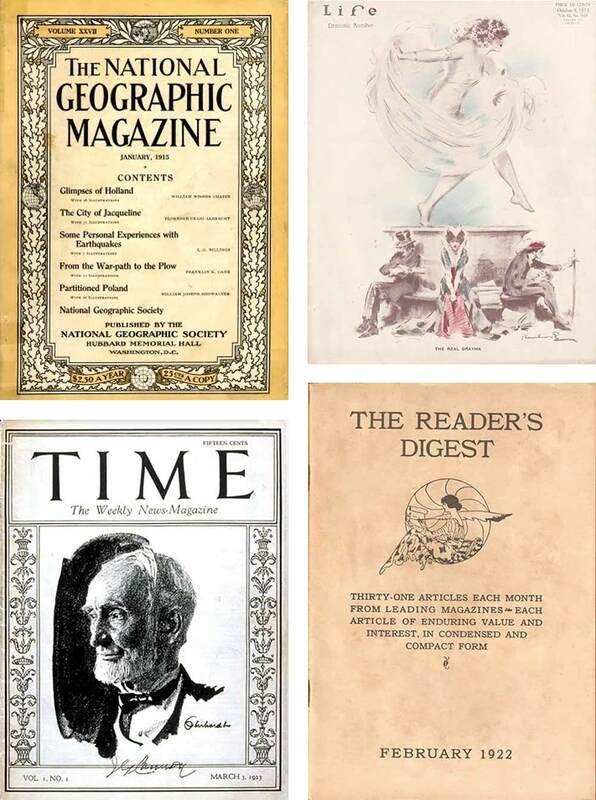 Several magazines such as ‘the National Geographic Magazine’ (1888), ‘Life’ (1883, but focussing on photojournalism from 1936), ‘Time’ (1923), ‘Vogue’ (1892) and ‘The Reader’s Digest’ (1920) starting reaching millions of readers. Newspaper sales also grow and in book publishing the paperback is introduced. Part of the growth of print media is due to the increase in advertising revenue. In 1901 the advertising budget of Coca-Cola is $100,000 – a large part of which goes to advertising in these new magazines and newspapers. Four color lithography is by now an established production technique. Jules Chéret, who is often called the father of the modern poster, is one of its early adopters. 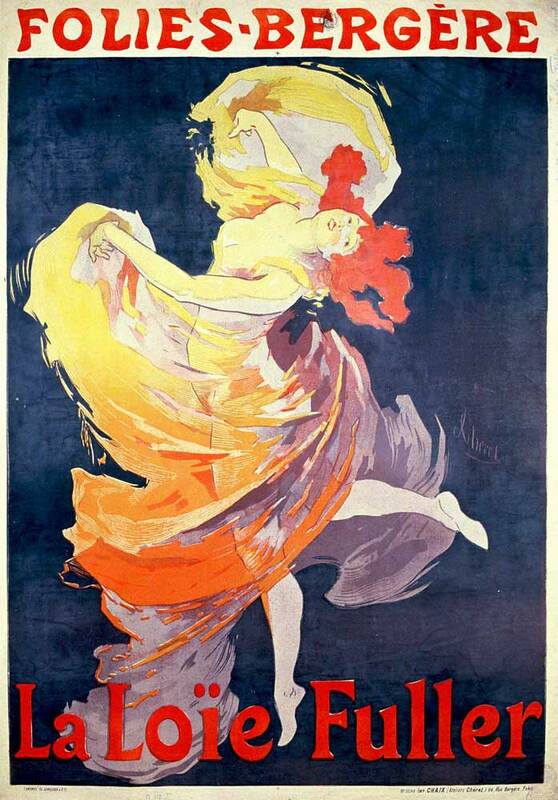 The poster below is a typical example of one of his Belle Époque masterpieces. Offset lithography is a further evolution that takes full-color printing to new quality and affordability levels. During this era the first Japanese press manufacturers also emerge. The KOLBUS ‘Rupert’ is a book spine rounding and surface pressing machine that will remain in production for 55 years. 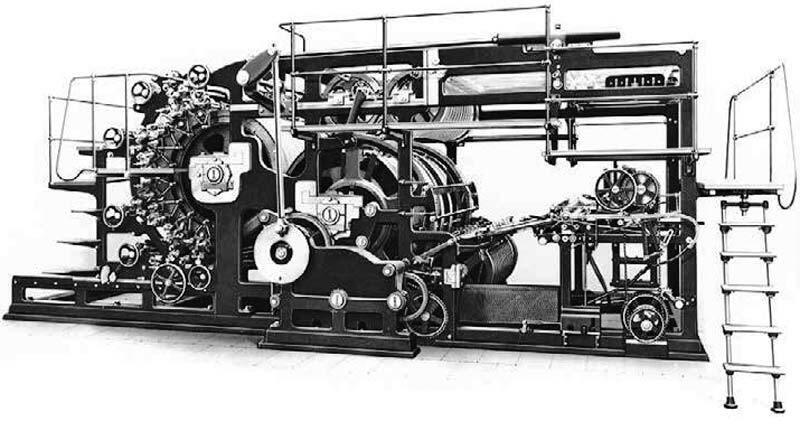 It is the first in a long line of KOLBUS book bindery machines.Below are some examples of bindery machines from this era. 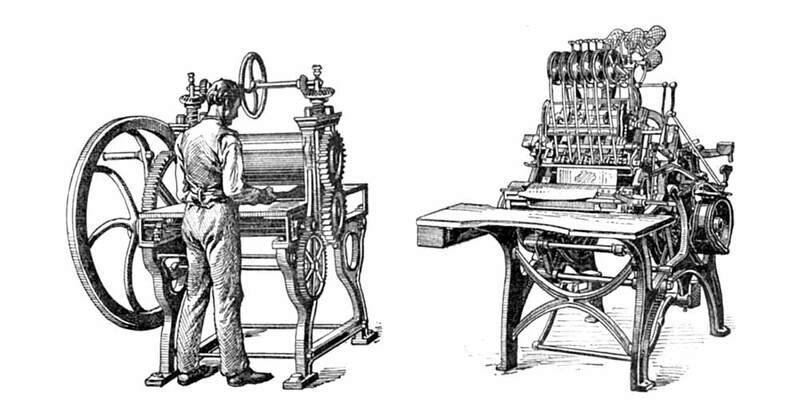 Below are some examples of bindery machines from this era. Above are cutting tables and below are machines for laminating and sewing. In Tokio Enkichi Kimura and Ginjiro Furuya found Toppan Printing, which will become one of the biggest printing companies in the world. The advertising agency McCann Erickson is established in New York City. By opening offices in Europe in 1927, South America in 1935 and Australia in 1959 it becomes one of the first global advertising agencies. Two years earlier American printer Ira Washington Rubel accidentally discovers that printing from the rubber impression roller instead of the stone plate of his lithographic press produces a clearer and sharper printed page. Based on this finding and after further refinement, the Potter Press Printing Company in New York produces the first lithographic offset press for paper. 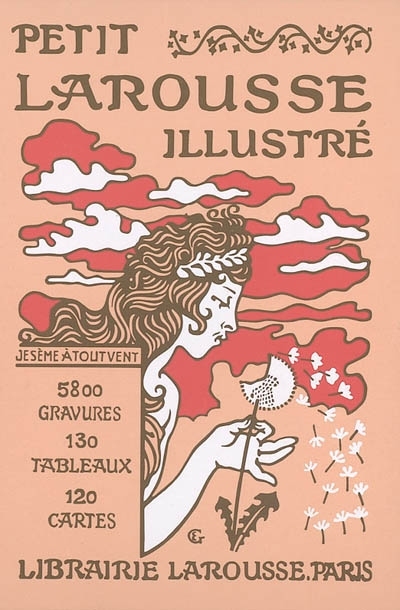 Le Petit Larousse Illustré, a single-volume encyclopedia, is published for the first time. The Englishman Samuel Simon is awarded a patent for the process of using silk fabric as a printing screen. Screen printing quickly becomes popular for producing expensive wallpaper and printing on fabrics such as linen and silk. Screen printing had first appeared in China during the Shang Dynasty (960–1279 AD). The first offset press to bear the name Roland appears on the market. It is manufactured in Offenbach, Germany by Faber & Schleicher AG. The company had been founded in 1871 and started shipping its first Albatros press 4 years later. Their 1922 single-color Klein-Roland 00 offset press can print up to 5000 sheets per hour. US newspaperman Hermann Ridder founds the International Typesetting Machine Company which manufactures the Intertype. This typesetter has a simpler design than the Linotype. 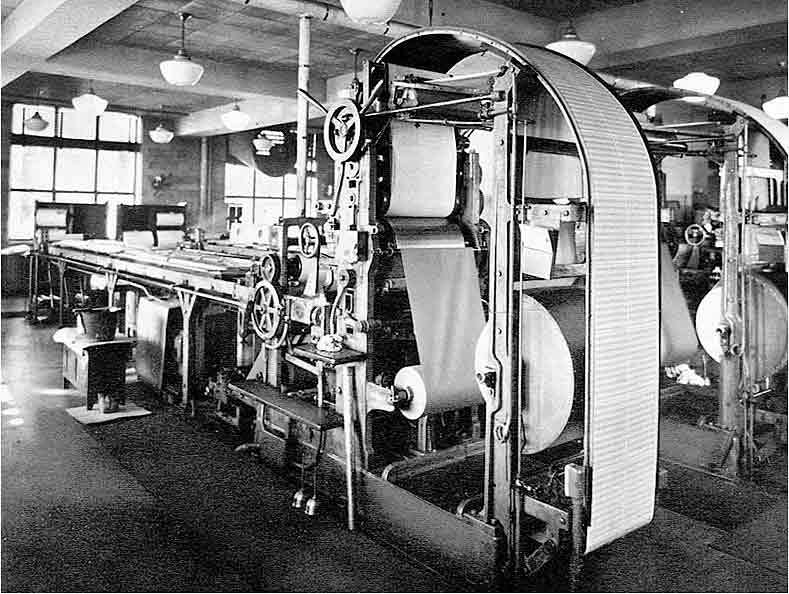 Late 1912 the first machine is installed at the New York Journal of Commerce. It costs $2150 which is over $53000 in today’s currency. There are already 560 offset presses in operation in the United States. By the 1930s it is the dominant form of lithography. The Bugra trade show takes place in Leipzig, Germany. Bugra stands for ‘Internationale Ausstellung für Buchgewerbe und Graphik’. Around 2.3 million people visit the show which sees its visitor count reduced dramatically after the outbreak of the first World War. 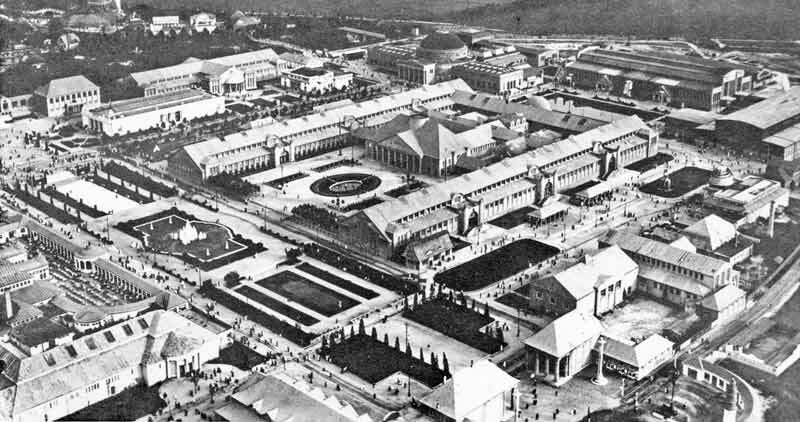 This is the precursor to the drupa trade shows that take place in Düsseldorf after Leipzig becomes part of East Germany after the second World War. 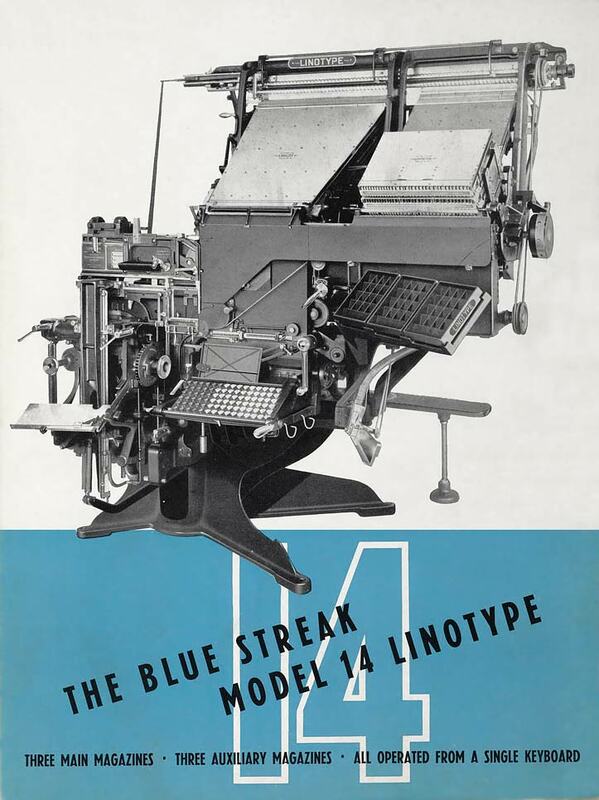 Model 14 of the Linotype hot metal typesetter can be equipped with one, two or three full-size magazines containing typefaces, like Model 8. What is new is the inclusion of an auxiliary magazine that does not interfere with the shifting or removal of the main magazines. To shift from one face and size to another the operator simply turns a handle without having to rise from his chair. In the USA demand for coil stamps is so high that Benjamin R. Stickney designs a dedicated press for stamp production. Stickney presses are manually controlled, single-color, web-fed printing press and gumming machines. They remain in use at the Bureau of Engraving and Printing until 1957. Hallmark, founded in 1910, creates its first Christmas card. The example below is from that era. 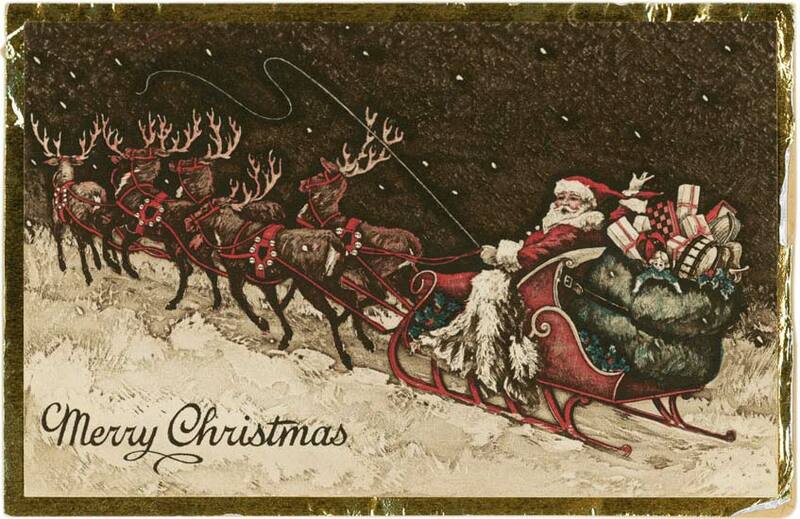 Forty years earlier Boston printer Louis Prang had been the first to offer a line of Christmas cards in the USA. 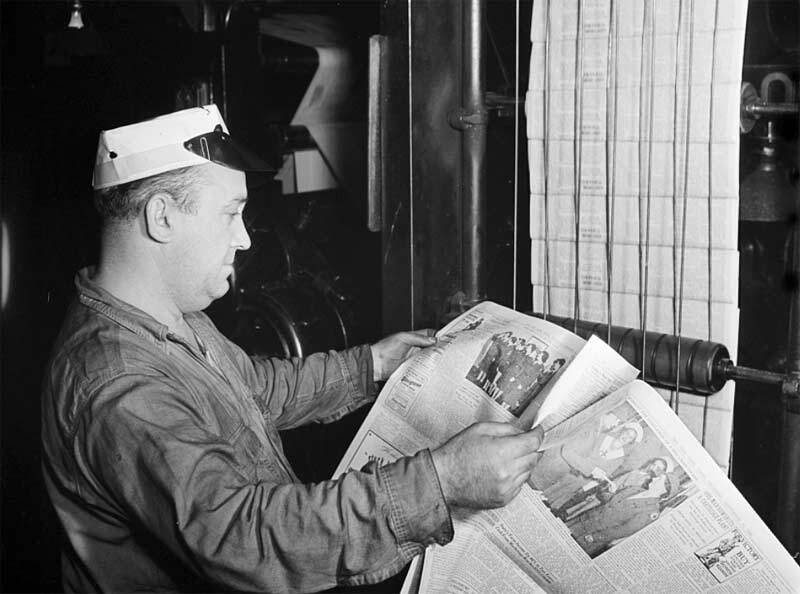 Pearson, formerly a building and engineering company, purchases a number of local daily and weekly newspapers in the United Kingdom. The group gradually evolves into one of the largest educational publishers and book printers in the world. Its subsidiaries include Prentice Hall, Longman, Peachpit and Addison-Wesley. Book and type designer William Addison Dwiggins coins the term ‘graphic designer’ to describe his activities as an individual who brings structural order and visual form to printed communications. The term only achieves widespread usage after the Second World War. The four-color Iris press from Koenig & Bauer can be used for printing banknotes. Over time security printing becomes one of the main focus points of the company. Komori Machine Works is founded in Kitashinmachi, near Tokyo. Their first lithograph roll printing press is developed in 1925. 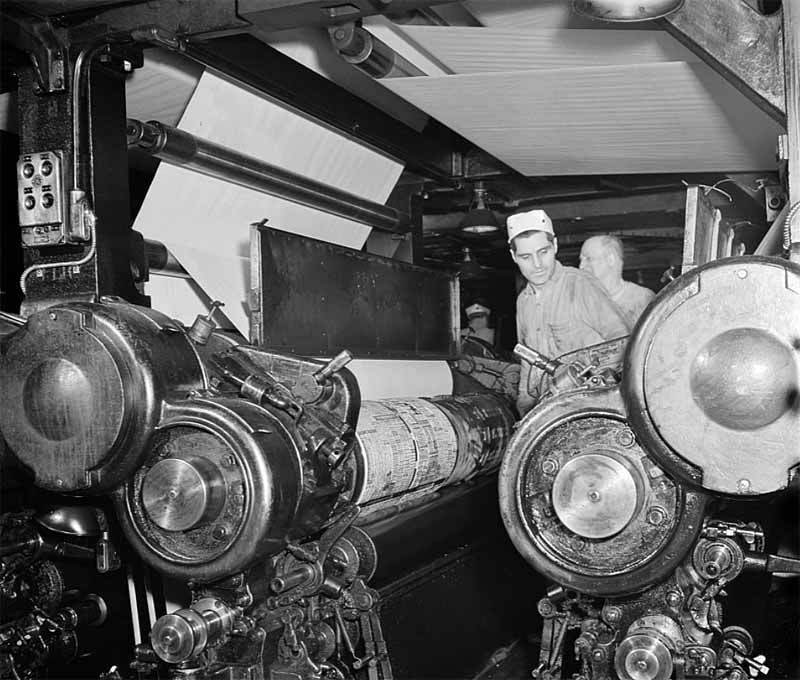 A 32-inch manual sheetfed offset press follows in 1928. Addressograph International merges with American Multigraph to form the Addressograph-Multigraph Corporation. For decades this company will dominate the market for addressing and duplicating machines. 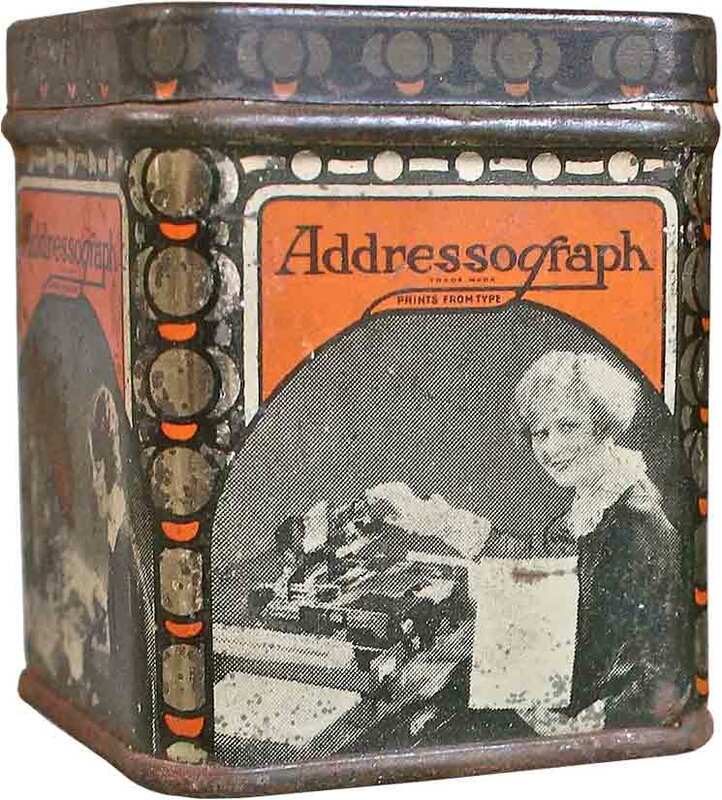 The image below shows a tin holding ribbons for an Addressograph machine used for labeling envelopes. The Autovariable is a press for cutting and printing cardboard boxes. It is a hit at the Foire de Paris, saving the Swiss company that was founded in 1890 from bankruptcy. 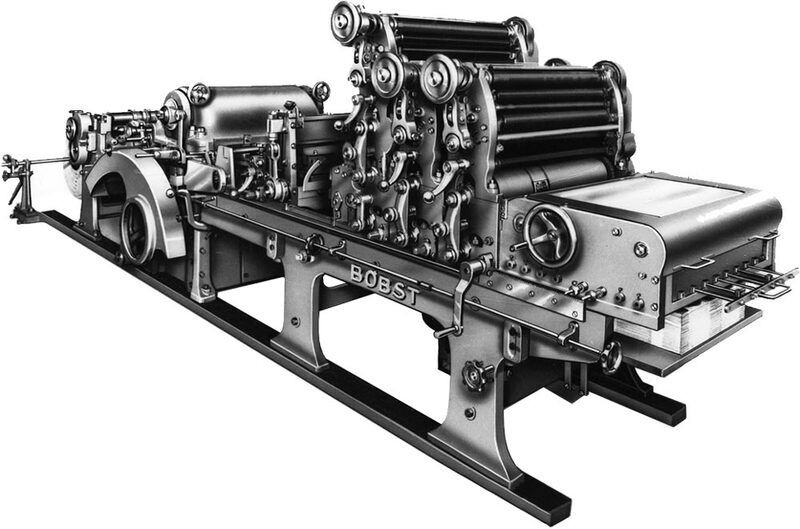 Their next major success will be the Bobst AP 900 automatic die-cutter, launched in 1940. 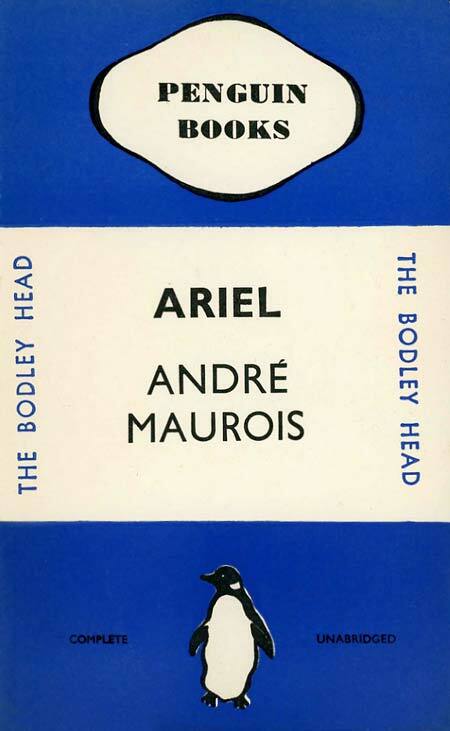 The first commercially successful series of paperback books is published by Penguin Books in the UK. Earlier in 1931 German publisher Albatross Books had already tried to market a series of lower-priced books with a paper cover and glue binding. Penguin copied many of the concepts of their failed attempt, such as the use of color-coded covers. The books cost sixpence each – the same price as a packet of cigarettes. Ray Stanton Avery invents the first self-adhesive label, meant to make it easier for stores to price their products. In 1990 his company, Avery International, will merge with Dennison Manufacturing to become Avery Dennison. Xerography, a dry photocopying technique, is invented by Chester F. Carlson. In 1947 Haloid Company, now known as Xerox, obtains a license to commercialize the technology. In 1938 the Dresden-Leipziger Schnellpressenfabrik AG changes its name to Planeta. 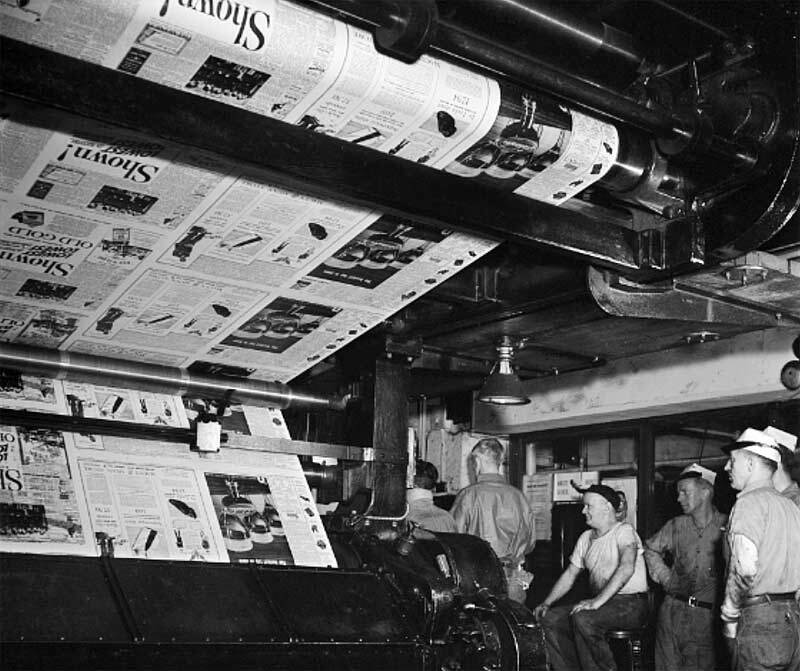 Six years earlier the company had introduced the world’s first four-color web offset press. After World War II Planeta becomes the largest press manufacturer of the DDR. It is acquired by Koenig & Bauer (KBA) in 1991. Emil Lumbeck is the first one to successfully use cold-glue binding for books (Lumbeck-Kaltklebebindung). The V-50 is the latest in a series of vertical cylinder presses that combine easy access and convenience with a compact footprint. It can print 5000 14×20″ sheets per hour. 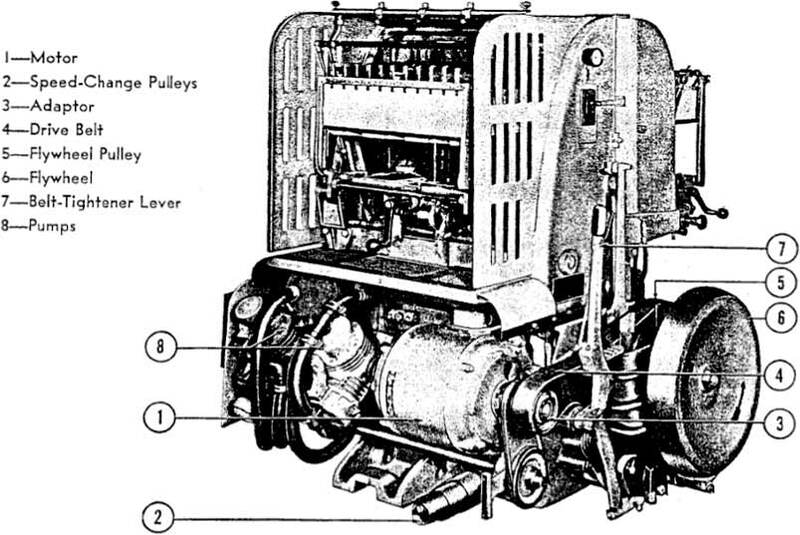 Miehle’s letterpresses will still be produced until 1978, gradually losing market share to offset lithography presses. Of the 25000 that were built thousands are still in use today for die cutting or scoring (adding a mechanical crease to sheets so they can be folded more easily). 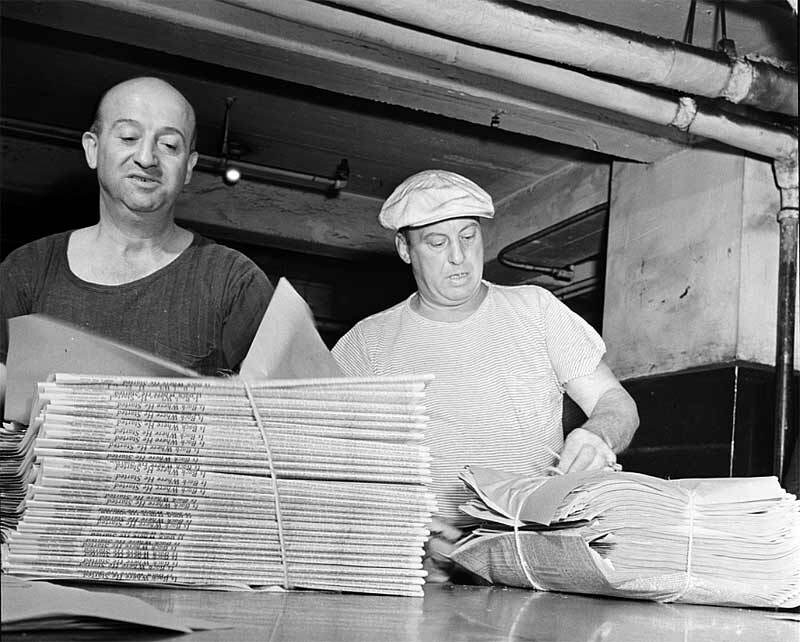 Marjory Collins photographs the production of the New York Times in order to document home front activities for the U.S. Office of War Information. Pictures from the prepress departments can be found on the history of prepress page. In the image below you see the plates being loaded on the press. As soon as the first copies come off the conveyor belt a pressman checks for press defects. 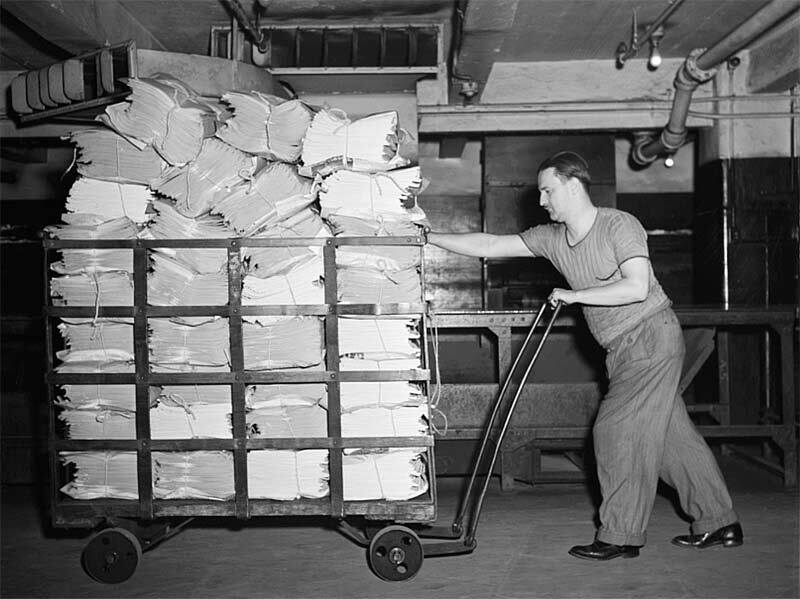 In the mailroom the finished papers are wrapped in bundles according to orders. From there those bundles are then carted to the delivery trucks. You can find the entire collection of 84 photographs here. Polar build the Einmesser-Schnellschneider, their first electrically powered cutting machine. In 1954 they build the first cutters with an optical cutting line indicator and air cushion table. Shinohara Machinery Company, the Japanese machine tool manufacturer which had been established in 1919, begins manufacturing flatbed letterpress machines. The July issue of Fortune magazine contains the first commercial scanned color image. It is produced using a scanner built by the Austin Company.